While I'll always be a little romantic about hole-in-the-wall eateries that occupy an unassuming spot within strip malls, they're sometimes a risky bet—these places are out of the way for a reason. Despite being burned on several occasions, the fact remains: These restaurants are the final frontier for anyone who enjoys a good meal. Sure, Utah's culinary scene has its share of rock stars and spectacles, but we'd be remiss to disregard the underdogs of Utah's restaurant culture. Doing so might make people pass on Horn of Africa (1320 S. Swaner Road, 801-908-5498). It's home to accessible and tasty Somali comfort food, and also one of the best places to experience a true gastro-cultural history lesson—when you sit down to a big plate of fettuccine noodles piled high with bone-in goat meat ($12.99), you can't help but start asking questions. Historians will tell you that Somalia's presence in the Horn of Africa, the continent's easternmost peninsula, made it a valuable target for European colonists. Most every European power had a stake in the area, including Italy. When Italian colonists arrived to set up shop, they made sure to keep a steady supply of pasta coming into the country. So, like many natives who have experienced the receiving end of colonization, the Somali people adopted pastas like spaghetti and fettuccine as the starch component to their meat dishes. Goat happens to be among Somalia's livestock of choice, so it wasn't long before they started serving up chunks of finely cooked goat meat atop this Italian staple. Visiting Horn of Africa today—hundreds of years after this cultural exchange took place—essentially means you can partake in a bit of food history that you just can't get anywhere else. In case my mention of goat meat makes you hesitant, don't worry—it's one of the most memorable meat dishes that you're likely to encounter. I've tried goat a few times now, and this interpretation is among the best. If you're the type of person who gets turned off by pulling meat off the bone, then this and the lamb might not be for you. On the other hand, if your mouth waters at the extra flavor that roasting meat on the bone imparts, I highly suggest giving this dish a try. If meat on the bone is a deal- breaker, rest easy—there's still plenty on the menu worth sampling. If you're looking for a pasta dish, the spaghetti and steak ($10.99) is fantastic. They don't skimp on the pasta—this is a gigantic scoop of spaghetti, thinly coated with marinara and served with well-seasoned slices of skirt steak and roast peppers. There's not much that doesn't go well with spaghetti, but I admit that I've never thought to eat it with steak until my visit. I also recommend the chicken and rice ($9.99) which combines the same seasoned peppers and meat with a plate of fluffy rice instead of spaghetti. In addition to the cultural deep dive while dining here, the menu doesn't have a bad dish to speak of. Every item is a solid blend of flavors. I'm pleased to say that, thanks to Horn of Africa, Somali cuisine now includes Philly steak sandwiches ($10.99)—they're serving up a rendition of the American classic that's been spiked with Somali spices. 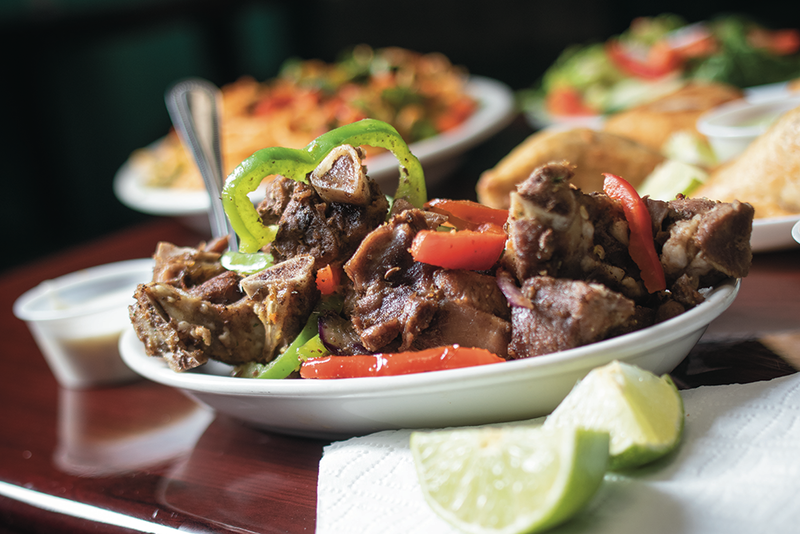 While Horn of Africa is a great spot for generous helpings at reasonable prices, it's also one of those rare places where culinary traditions that originated a long time ago in a country far, far away have arrived in Utah for us to enjoy. Thinking back on the blood, sweat and tears that spawned the Somali dishes that Horn of Africa serves made to order, it's hard not to reflect on the rich history that this food represents. Plus, it's not often that you get to eat the history lesson after you're done learning it. Open: Mon.-Sun., 8 a.m.-9 p.m.